One of my money saving tips on the Rachael Ray show was to buy the number of newspapers for the number of members in your family. The reason I recommend this is so you can maximize your savings. For our family, I’d get 4 newspapers. Then I have 4 coupons for the various products that I buy regularly. Which translates to 4 times the savings! Here’s a simple example using canned tomaotes. Let’s say a canned tomatoes regular retail price is $.97. A coupon for these tomatoes comes out in the paper for $.50 off 2 cans. My store doubles coupons, so the coupon really is $1 off 2 cans. With my 4 coupons from my 4 newspapers, I have the potential to save $4 on 8 cans. (Still with me???) Let’s look at the different cost possibilities in the following scenarios…using 4 coupons and buying 8 cans. Would you rather pay $1.60 or $7.76 for 8 cans of tomatoes??? But why buy 8 cans of tomatoes??? If I did not take advantage of the coupon and sale price, then I would pay too much for the tomatoes. I buy 8 cans that will last me 2 months until the next set of coupons and sales come back around. This is called “stockpiling.” Saves you from having to pay regular price for items in between the sales cycles. Answer: You can use as many of the same coupons on as many of the same products, in the same transaction. You can NOT use 4 coupons on 1 product. If you have 4 coupons for the same product, you have to buy 4 of that same product to be able to use the same coupons. So, how do I get more newspapers and is it worth paying for them? You can save 50% or more on local newspaper home delivery from Discounted Newspapers.com! Head on over there to order an extra paper or two to maximize your savings!!! 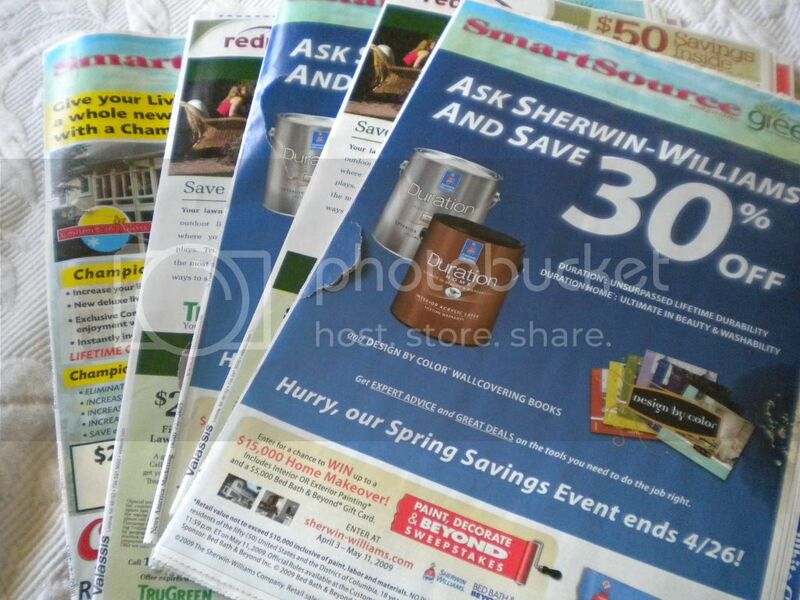 If you are going to effectively use coupons, then yes, it is worth getting extra newspapers…especially when discounted! Coming Soon…Where to find coupons! You could save even more by just getting the inserts from family/friends/neighbors who don’t use theirs. Great idea! I do get one paper from my mother-in-law! At work everyone brings in the inserts (minus the ones they took out) and we then cut out coupons we want and pass them around at lunch. Where do you shop that ‘doubles’ the coupons? Since I live in the Houston area, I have SEVERAL options for grocery shopping, but in reality, they’re all the same with a nickel or two different on certain products. I think I read somewhere that you should buy 1 paper per person in your family. That is 4 in our house and works pretty well. I’ve alerted my neighbors that I may occasionally pick their coupons out of their recycling bins on trash day. I clip out the coupon, then add the paper back to recycle. Everybody’s happy! Thanks for the post! I do coupon, but keep wondering how many papers I should get. I generally get 2, but we have 4 people in our family. Question….where does the money for the newspapers come from? Is it out of the grocery budget? Not for us, but that would be a good place to draw from. I’d say minimum three, no matter what. I checked the site for my local paper. Its 25 cheaper. Not worth is for me, when I don’t buy the holiday weekends (no inserts). I’d rather buy from the store, checking for the inserts when I purchase them. I have been clipping for a while now, but am at the point to get my binder set up. My question, though, is ….Most coupons are for name brands. Do you think it is cheaper to get products in store brands or use coupons? I know the answer could go either way, depending on the sales, but just curious. I usually look at the store brands before the name brands, therefore rarely go to my coupons b/c it’s cheaper. And how I wish I had a store that doubled coupons! Post a wanted ad on craigslist.org for coupon inserts. I can pick up about 15 papers a week by doing this. I could get more, but I just pick up from people who live close by. I sent out an email at work and asked all my friends to bring theirs to me if they don’t use them. I use what I need from them and cut out all the rest (YES ALL of them) and take to our mobile home clubhouse where we send in all good (not expired or close to expire) to our troop’s wives. We are nearing 1,000,000 coupons sent. I don’t buy any papers, get all the coupons I can possibly use, and am able to do a volunteer project and help others. So now instead of just vegging out in front of the tv, I clip coupons! Oh, and all my friends are happy to share them with me because they know I am sharing them. I get several inserts from my family and friends but when their are great coupons like the $2.50 Fishish coupon. I will buy extra from clipping services. It sometimes makes more since to pay for someones time to clip extra coupons than to buy 10 papers for that one coupon. I found that about 10% of the coupon value is what you will pay someone to clip it for you. I bought 10 Finsh coupons for $3.40. It would have cost me at least $10 for 10 papers. The Finish is on sale this week for $3 at Meijer. Math $3 – $2.50 = $.50 + $.34 for extra coupons = $.84 a box! I am pro. LOL! You can do like I do swipe the neighbors Sunday paper out of their recycle bin and get the coupons out of it. My husband hates when I do that. Heather, I’m also in the Houston area. Kroger and Randalls both triple coupons up to $.35 and double up to $.50. BUT (and it’s a big but), Randalls will only double/triple one like coupon ($.x off of product y) and Kroger will only double/triple up to three like coupons. On a side note, I’ve found that the 99 cent only store is a good place to buy my papers. Maybe other dollar stores sell them too. No matter how many or few i buy, i always get them in multiples of two. that way i’m covered if the Great Sale happens to be a BOGO! I get all my coupons free… well sort of – my husband delivers the paper for extra money. I just need to get them more organized cause the way I have them now, I don’t use them all the time. I’m catching on that you don’t use any of the online services to help you pick the coupons to use either – you seem to just go through your ads yourself? Maybe you’ll talk about that in another post (I’m talking about like grocerygame). At the grocery store where I shop, they only double the first coupon for each item you purchase, so in order to use 4 coupons, I would have to do it in 4 separate transactions (which I don’t have a problem with, since it saves me money.) We get two newspapers at our house, and sometimes I get coupons at work, or from my MIL, but I get overwhelmed with trying to keep up with all the coupons on a regular basis. Where does coupon clipping fit into your schedule? Send the coupons you don’t use or expired coupons to military families overseas. We (yes I’m one of them) can use coupons up to 6 months after the expiration date. Here is a different blog that has the addresses of places you can send them (http://www.grocerysavingtips.com/expiredgrocerycoupons.htm). It’s great program and we REALLY appreciate it. I Googled “where to send expired coupons” and came up with 291,000 listings. I too have several neighbors give me their coupons every week and this has added up for a huge savings for me. Yesterday I had to make a quick run to WalMart for several items I had run out of and only paid 8 cents for a bottle of salad dressing. That plus a dollar for a head of lettuce gave me several meals this week. All total, I purchased 12 items for less than $20. I saved $4.50 in coupons. Not bad. Keep up the good work. I enjoy this website so much. krista, i’m in houston too. i live with the krogers and randalls limits. here’s how: neither store will mind if you do back-to-back separate transactions. i put a small hand basket in the big cart, and drop the items (and their coupons) in there when i am going over the doubling/tripling limit. i can do this with both kids (3 and 4) in tow, but it did take some practice. if you are going to do multiple transactions, you need to (a) avoid the self-scan line and (b) not use the express checkout. as long as i follow those rules, no one has ever objected. but… even though there are 4 people in my family, i normally only buy 3 papers (because of the limit). if there are some really sweet coupons, i’ll buy 6 papers. with 6 sets of coupons, i can hit the limit at krogers twice and make it worth messing with the separate transaction. Is it good enough to just subscribe to Sunday papers or do you miss coupons that way? I am lucky that my drugstore discounts papers if you have their rewards card, so I save 20% off the price of the paper. We also share coupons at the college I teach at and have even gotten some of my students interested in using coupons. If I know what they are looking for–makeup, snack foods, soda, HBA, etc. then I will keep my eye out for them and save the coupons I find for them.